This month saw me nake a start on the challenge of writing fifty songs in ninety days for the fifth consecutive year. Just to make the challenge a bit harder, I decided that I'd also release a high-resolution version of one song as a single on Bandcamp every Saturday. I enjoyed coming up with a design for the cover of each release almost as much as I did recording the music! When I was a kid, my parents used to leave the light at the top of the stairs on all night. My father still leaves the hall light on all the time in his house. Maybe it's a reaction to this, but nowadays I find it almost impossible to sleep in a light room. I like my sleeping quarters to be as dark as possible. Before I had my new windows fitted this week, I had to take down the blackout roller blind in my bedroom, as it was attached to the old wooden window frames. I won't be drilling holes in the new frames, that's for sure - so I'll have to source an alternative method of blacking out the room. At the moment it gets light here by 5 am, so that's when I wake up, whether I want to or not. After a week of rising early like this, I feel absolutely knackered. Those late Winter sunrises can't come soon enough. My hand has more or less healed after last week's unfortunate accident with a broken glass, but I suspect I'm going to have a nice scar to show for it. The good news is that I'm back playing the guitar again, so I've resumed work on 50/90 and have also released the latest track for my Saturday Single challenge. It's called What Happens Next Is Incredible. I'm rather pleased with this one. 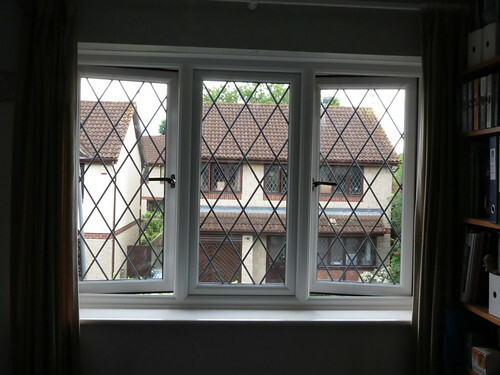 I've just upgraded a 27-year-old installation of Windows. Every three or four years since I moved here in 1995 I've had to spend two or three days up a ladder, sanding down and repainting the woodwork on the windows. The original frames were, I suspect, not particularly high quality and they really haven't stood the test of time. That's been particularly evident with the windows at the front of the house, which faces South. Not only was the wood on these windows disintegrating, but the seals on most of the panes had failed. If they had ever been filled with an inert gas like Argon, it was long gone. In the winter they would fill up with condensation and crud, which really didn't look very nice at all and they didn't provide much in the way of insulation against the cold. I knew that this year I'd have to go up the ladder again, but I decided I'd had enough. So at Christmas, I decided I'd treat myself to getting new windows installed by the end of this year. The work was completed this afternoon and as you can see above, the new windows look rather swish. Switching the inside frames from dark brown to white has made each room noticeably brighter, which is lovely. The technology has changed quite a bit in 27 years, too. The gap between the inner and outer panes of glass in the new windows looks to be more than twice that of the old, and the spacers between the sheets of glass these days are made of plastic rather than aluminium. The inside surface of each pane has a low emissivity coating that is designed to reflect heat back in to the building. All this means that the windows are rated as A-2 for energy efficiency, so I'm expecting my heating bills to be noticeably smaller this winter. That's no bad thing. But I'm most pleased about the new windows' sound insulating properties. When they're closed, most outside noise is inaudible. With the bedroom window shut at night, I'm no longer being woken up at four in the morning by the milkman's clattery old Ford Transit. Instead, I'm sleeping through until 5 am, when it gets light. That's still way before the alarm clock goes off, but it's a significant improvement. Believe me, it's been worth the expense just for that. While I was doing the washing up last night there was a loud crack as the glass I was holding split into three very sharp pieces and cut a two-inch gash down the side of the middle finger of my left hand. There was blood everywhere, but I managed to not freak out (possibly because the glass in question had recently contained a large gin and tonic.) Eventually I managed to stick things back together without having to visit the nearest A&E, but my fretting hand is now mostly Elastoplast and my guitar technique has been somewhat compromised, to say the least. Despite this, I have had a productive day and managed to record several pieces of music for 50/90. As it's a Saturday, one of them has been pressed into service as my latest single, and is now available over at Bandcamp. Rather appropriately it's called Two Fingers. It's well over a decade since I first discovered the music of Dominic Robertson - who you may know as Ergo Phizmiz, and who is currently enjoying a spectacular burst of creativity as his latest alter ego, the Composter of Music - and I've been a fan ever since, as evidenced by his multiple appearances in this blog. Dominic is currently preparing his latest opera, The United Kingdom of Earth, and it looks like it's going to be a hoot. I love it when my musical acquaintances discover each other's work, and fellow FAWMer (and ace musician) Pete Murphy is a prime example. He's been so taken with Dominic's approach to things that he's just released an album of cover versions of Ergo's music, and it's absolutely bloody marvellous. You can get your copy here! I've got a lot happening over the next few days so this week's Saturday single is being released a day early. I hope you enjoy it, it's called Troll. There has been lots of chatter on the Internet over the last few days concerning the future of Soundcloud, the service I use for hosting the music that's embedded on this website. TechCrunch's report suggests that despite making lots of people redundant this month, the longer term prospects don't look good. The company reportedly only has enough capital to take it into the last quarter of the current financial year. As I wrote in the blog recently, I dumped Soundcloud's paid plan after being increasingly frustrated by their inability to control spam and scam artists; it looks like their problems run much, much deeper than that. I won't be shedding any tears if they do go to the wall. My brother will be visiting the UK next week, so I am taking the week off. I plan on chilling out with family and generally trying to unwind a bit. Making my way home along the motorway last night I was struck by how the weekend getaway has spread from the school holidays to include pretty much every weekend during the summer. The amount of traffic heading Westward was staggering. Last summer I switched to driving back from work across country on Friday afternoons once the schools broke up, but this year it looks like I need to start doing so earlier. Are people staying in the UK for their holidays more after the Brexit vote, I wonder? The plan is that I'll release a single every Saturday between now and the end of 50/90 on OCtober 1st. After seeing photos of Mike Pence visiting NASA and pointedly ignoring the large sign that said "DO NOT TOUCH" in bright red lettering, this one pretty much wrote itself. It's called Get your filthy hands off my spaceship. For the last month or so I've been trying to get the house into better shape. I've lived here for more than 22 years now, and over that time I have accumulated an awful lot of stuff. I tend to hang on to things for sentimental rather than practical reasons, and it's got to the point where I don't have the space to do that any more. So, things have had to change. Over the last six weeks or so I've taken shopping bag after shopping bag of books to the local charity collection point. I've recycled several sacks of old clothes that I no longer wear. Some clutter has gone into the recycling, and a fair amount has quite simply ended up in the bin. There is far, far less stuff in the loft than there used to be. All this probably hasn't made a difference that would be visible to anyone else, but I can see an improvement and it feels good. Today, with the help of one of my friends, I'm going to take my old Panasonic television to be recycled. It's an old CRT model from the days of analogue TV; I bought it before Freeview was even a thing, so it must be nearly 20 years old. It weighs a ridiculous amount and it's the size of a small fridge, so it has to go. The house is way past due some TLC, too. It still retains the original windows from when it was built in 1990, and the wooden frames are fairly low-quality softwood. They really haven't stood the test of time and exposure to the elements. The south-facing frames in particular have been clobbered, and are well overdue for another coat of paint. However, even if I could face spending another couple of days up a ladder sanding and filling and painting everything, quite a few of the seals on the windows themselves have failed. The panes are beginning to fog up with nasty, unsightly gunk, so I'm having them all replaced with uPVC ones and for good measure I'm getting new doors for the front and back, too. It's all going to be fitted later this month. I'm rather looking forwards to seeing the results. This week's single is now up on Bandcamp, and it's called Nasty. This is why I try to avoid driving anywhere during the day. Just like the rest of the Internet, I have become fascinated this week by the postings of InspiRobot, which generates a bewildering stream of motivational memes (a pithy statement superimposed on a photograph which may or may not be relevant to the text). It's the brainchild of Peder Jorgensen, a recording engineer and sound designer based in Oslo. Launched in 2015, the site appears to use a neural network to generate content, but instead of improving its behaviour over the last couple of years, it's remained static - the humour and entertainment value become most apparent on the frequent occasions when InspiRobot doesn't quite get it, and actually teaching the AI to get things right would absolutely spoil the fun. The results run the gamut from delightful to disturbingly dark. Recommended.